As one of the most popular late-night sketch comedy shows of all time, SNL has a wide influence on pop culture. By selecting Donald Trump as a host, they legitimize Trump’s campaign rhetoric - which is rooted in racism and fear-mongering - and make the real-world violence he incites against people of color a laughing matter. It is irresponsible and dangerous for NBC to provide Trump with a free national platform to further fan the flames of racial intolerance. Given SNL’s appalling history of black and brownface, discriminatory hiring practices, and consistently reproducing some of the most dehumanizing stereotypes of Black and Brown folks, we already know that they will do almost anything to appeal to lowest common denominator. Tell NBC and SNL: Stop promoting hate. 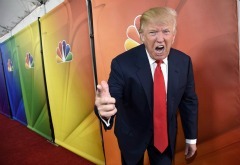 Cancel Donald Trump’s appearance on Saturday Night Live. Don’t provide a platform for Donald Trump’s dangerous racism and xenophobia. Cancel his appearance on Saturday Night Live.